Grand Rapids – Filip Zadina’s education as a professional hockey player continues. Most often, those lessons come on the ice. Occasionally, though, they occur off the ice, such as after Friday’s game in Rockford, Illinois. The Grand Rapids Griffins played there, won, then returned to west Michigan around 5:30 a.m. because of the snowstorm that hit the Midwest. The lesson: Be ready for anything. This is the American Hockey League. And you’re going to have another game in hours. “I got home around 6 a.m.,” said Zadina, in an empty Griffin’s locker room after Saturday’s 3-0 victory over Milwaukee at Van Andel Arena. “I wanted to go straight to bed. I tried to fall asleep right away but I couldn’t. I woke up around 11 (a.m.) – couldn’t sleep. “So I slept about five hours, and we played a tough game tonight. Life in the AHL isn’t always easy, and hasn’t been this season, as Zadina, just 19, is learning. Zadina, the Red Wings’ first-round draft pick, No. 6 overall in 2018, didn’t register a point Saturday, the fourth consecutive game he’s gone pointless since scoring twice (and adding an assist) in Belleville Jan. 11. In 33 games, Zadina has 10 goals and 10 assists (20 points) with a team-worst minus-15 rating. He has so many things to learn. To use his linemates, and not try to do it all himself. To play within the system coach Ben Simon wants. To be accountable defensively. To be ready to play every game in a league where you can’t get away with stuff you were able to in junior hockey. 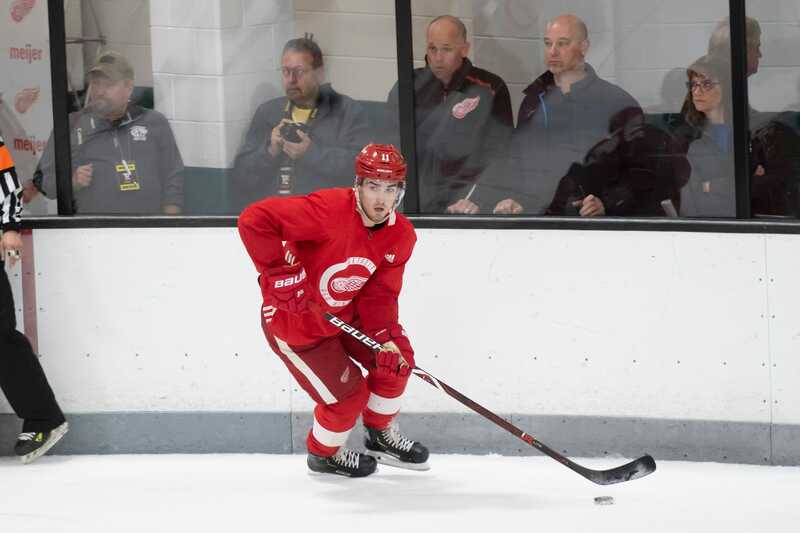 Zadina has heard that message often from Simon, the rest of the Griffins’ coaching staff, and from the Red Wings’ front office personnel who watch the Griffins. It is sinking in, and Zadina is understanding what they want from him. But for a teenager taken high in the draft, with the hype and expectations from media and fans swirling around him, patience can be just as challenging as a typical game in the AHL. There are lessons to be learned, remember. “Keep the puck a little more and create a play,” said Zadina of one part of his game that needs attention. “It’s pretty tough to just go and dump the puck and get the puck back sometimes. You have to keep it and create chances and then you can do anything on the ice. Zadina knows Wings fans are eager to see him in Detroit. He saw the excitement and media coverage around him at the development camp in June at Little Caesars Arena. But as much as Zadina wanted to make the NHL right out of training camp, he was realistic about his chances. The Wings don’t rush young players. Even now during an organizational rebuild, when that has been somewhat loosened – Dylan Larkin, Michael Rasmussen, Filip Hronek, Dennis Cholowski moved quickly, or didn’t play in the AHL at all – a special talent like Zadina is going to be taught pro hockey. There was disappointment, for sure. The Wings hoped Zadina would gain considerable confidence from playing in the recent world junior tournament, a tournament he dominated last year (seven goals in seven games). It didn’t happen. Zadina didn’t score, he had one point in five games (an assist) and was minus-3, in a forgettable two weeks for himself and his Czech Republic teammates. Simon didn’t watch much the tournament; life in the AHL demands you are either preparing for a game that day, or one that’s one coming shortly. But Simon felt it was good for Zadina to the close the chapter on his junior career – and fully concentrate on getting to the NHL. “You’re not playing against men. You’re playing against good players for sure – it’s the top players in that age division,” said Simon of the junior tournament. “I’ve played in that world junior a couple of years and it’s phenomenal. But then you compare that to pro hockey and it’s different, it’s very different. Simon acknowledges Zadina’s talent but knows he isn’t ready for the NHL yet. Whether Zadina gets a taste of the NHL this season remains to be seen. With another expansion draft looming in 2021, if Zadina plays nine NHL games or less this season he’ll be exempt from that draft. If he plays more than nine he burns a year of pro eligibility and the Wings would have to protect him in the expansion draft or potentially lose him to Seattle. Simon loves Zadina’s work ethic and desire for accountability, and believes those characteristics will help him in his climb to the NHL. “Filip cares; he’s willing to put in the time to learn,” Simon said. “There’s no issue there. Every day he comes to the rink to get better. He puts the onus on himself to improve on a daily basis. “Because of that, he’ll be successful. It’s just a matter of time to find some consistency and making sure the confidence doesn’t get too low or high, and if there’s an opportunity to take the next step, that he’s ready to slide up there and stay up there. This article was originally published by Detroitnews.com. Read the original article here.